Being a high school student is stressful, and the pressure to study to go to your top college and reach your dream job can make it even more so. On top of all of that, thinking about choosing a career path can be incredibly daunting, especially as a 16-year-old. However, DSST strives to ensure that all students have an opportunity to explore a career path that they are interested in. We do this by incorporating a class into the high school curriculum where students attend professional internships during their junior year. In these internships, “students are able to figure out what they want to do in the future… see if they see themselves in that career,” says Maggie Dering, the Internship Coordinator at DSST: Cole High School. During this 10-week-long internship, students are matched with organizations across Denver based on their interests, and attend an onsite internship for 4-8 hours per week during the school day. If a student doesn’t know what field they want their internship to be in, they have the support of each campus’ Internship Coordinator, who helps students uncover and pursue new passions. Dering, DSST: Cole’s Internship Coordinator, urges students to explore a multitude of career options and open their eyes to new possibilities; she wants to captivate students by new career fields so that they think beyond the idea that “their dad is a mechanic, [so] they want to be a mechanic”. Beyond acquiring professional experience, the internship program is also designed to push students out of their comfort zone and get a feel for how the “real world” works. Students are tasked with planning for and getting to their internship on their own, and are encouraged to embrace the obstacles adults face and problem solve. While the environment of each internship varies, as students are placed with organizations ranging from the Denver Zoo, Atlas Physical Therapy, Mike Johnston for Colorado, and Teach for America, each student gets a feel for a professional environment and has the opportunity to apply what they’ve learned in school to a real job. In both of these circumstances, students had the opportunity to grow personally and professionally, and are armed with more insight about their careers as they move forward. 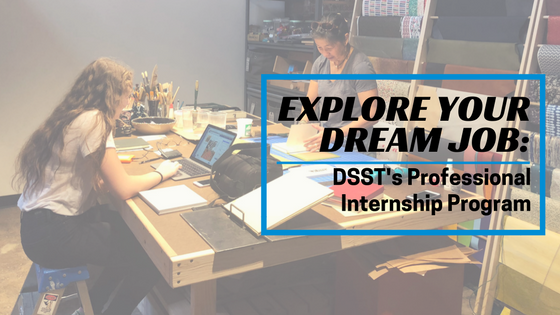 Whether students know exactly what they want to do after high school and college, or have no clue at all, DSST encourages students to explore their passions and see what their futures can hold. You never know what you might learn about yourself! This post was written by Alondra Rojas, DSST: Cole High School Junior and intern at the DSST Public Schools Home Office.